The biggest change we were able to witness when we transitioned to alternative seating was the change in teacher mindset. That was our purpose and it worked. We were living the true definition of insanity as we were doing the same thing we’ve always done. It expecting different results. Changing the atmosphere helped with this very much! I appreciate the reflective and thoughtful approach in this piece. I am commencing year 4 of alternative seating. I am in a gr 1/2 room and one of my purposes is that moving from kinder to grade 1, without desks, provides a more natural transition overall. I receive students who have not beem conditioned to desks and so the transition and routine building is actually quite seamless. 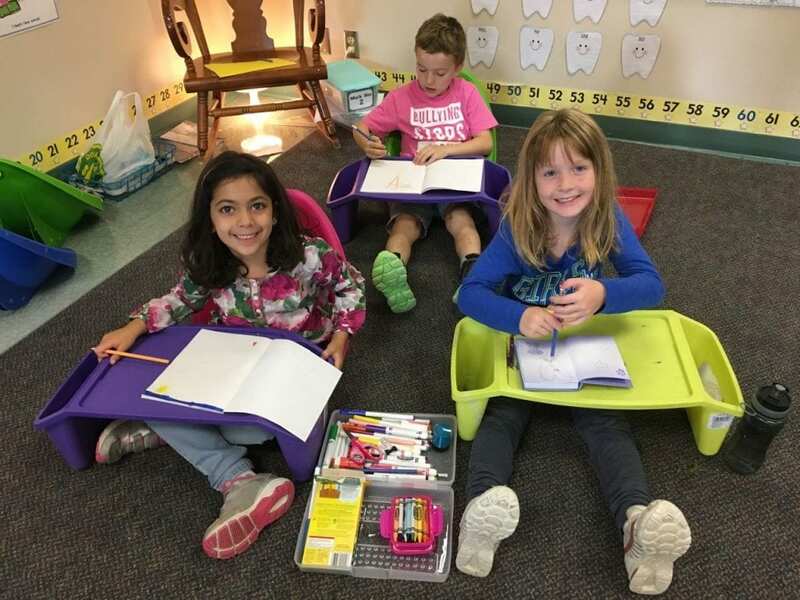 I am cognizant of the need for students being seated to see essentials in the room; such as the word wall and the teacher, or the smart board and have all my tables, coffee tables, etc. configured as such. I feel extremely confident about the benefits of alternative seating, but there are logistical things to sort through, such as supplies and storing daily work, and traffic flow, that was not referenced above, but I feel are important elements to consider. I think I’d like desks, but the kind with legs that can be raised, so they’ll work for my 6+ feet tall grade 12 boys AND the tiny 5 foot grade 12 girls! Chairs of various heights, too for the same reason. Desks and chairs are flexible for moving into groups, but also allow for ‘own space’ which students do like. Personally, I loved the wobble stools available in grad school (UBC-O), and would use one in my class room, but district Health and Safely said teachers can’t use them! (Noticed my principal has one, though, so perhaps I would have better luck getting them, now). I am a desk-user (sometimes even in rows! ), but I also have a very cozy reading centre, a round table, open floor areas, and a lot of counter space for kids to work at. One of the things that’s worked really well for us is collective decision-making about how we can best use our space for the tasks we’re trying to accomplish. The class, having been apprised of the basic outline and goals of an upcoming lesson, often votes to decide which learning space would serve us best (Shall we go to the carpet? Stay at our desks? Go outside?) During times when students are practicing skills individually, they frequently come to me to ask if they may sit somewhere other than their desk. One of the most coveted locations for easily distracted students is the desk we keep out in the hall (this is never used as a punishment, but is available for kids who want a quiet, private space to work). Having conversations about what works well to help them with different learning tasks helps them to develop mindfulness and take responsibility for their own learning. But still- is it evidence based practice? It seems a little pseudo-scientific. Show me the research, and then I’ll get on board- or on beanbag chair. Thanks for being willing to pay back a little in current trends.